I first met Ellen Gormley last year at the Knit and Crochet Show in Manchester, NH. I will admit, I was nervous. See, sometimes, I have trouble believing I’m a “grownup designer”, so when I meet other designers, I’m still a little star-struck. 🙂 Ellen is wonderful and so giving and kind. Ellen is standing behind and to the right of me. When the book came in, I immediately stopped what I was doing and flipped through it. This book is very well done. Now, other bloggers have talked about the bigger things: the motifs, the finished blanket patterns, and the great tips and tricks. All these are fabulous and you should definitely check out this book for those things. However, I want to talk about the first thing that grabbed me about this book…. I tend to notice the little things. Attention to detail makes my brain happy. These are things I’m not sure everyone else notices right away, but I did. So I’m going to talk about them. Do you see what I see? The colors up in the corner on those little boxes match the awesome colors in the motif! How cool is that? And what I didn’t show you was that the colors in the stitch diagram also coordinate. Do you see that???? The shape in the corner matches the motif shape! Ack! My little over organized brain had a total happy moment right then. Another cool thing? This is a spiral bound book. Which means it will lay flat while you crochet. LOVE this! The motifs are separated into the various sections depending upon the shape (squares, rectangles, triangles, hexagons, and octagons). There are ten motifs of each shape and she not only shows you these motifs, she shows you which of the other motifs in the book will coordinate with it. In the beginning of each motif section, Ellen tells you how to best lay out the motifs to put them together. In the beginning of the book, she talks about the various ways to connect motifs together. If you’ve ever avoided doing motifs because of the joining, check this section out. It will change your mind. I also love that she has a section on color choice. I have the hardest time with colors and figuring out what goes with what. Even after taking three years of art classes in high school. So, to get some real tips and tricks really helps. 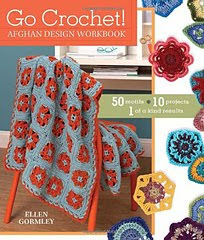 Finally, at the end of the book are ten different afghan patterns using the motifs in the book. They range from beginner (and stunning) to an advanced one that uses every one of the motifs in the book. LOVE! If you’re like me, and you love motifs, do yourself a favor and go get this book! It is definitely one that will reside on my “easy to get to” shelf. Okay, so everyone who knows me knows that I love crocheted socks. My sock yarn stash has a special bin that I can reach at any time. If I have extra money to spend, it will often go to sock yarn. This is because, to me, socks are the perfect travel project. They fit in my purse, are easy to do on a plane or bus, and allow me to make something for myself in a short amount of time. I actually bought a pair of shoes that show off my crocheted socks and wear them proudly to any yarn event. My socks never match my outfit, and I don’t worry about that. So when I heard that my dear friend and fellow designer, Karen Ratto-Whooley, was coming out with a sock book, I was so excited. When she asked me to do a stop on her blog tour, I was over the moon. The book is I Can’t Believe I’m Crocheting Socks and is published by Leisure Arts. First off, a little about Karen. She is so completely awesome. I met her in person at the 2010 Knit and Crochet Show. We clicked instantly and hung out most of the weekend. Unfortunately, we were so busy chatting and having fun that we failed to get a photo together. And of course, we didn’t notice that until we were back at our respective homes. She is the utmost professional, and a very talented designer. Okay, so the book. When I got it in the mail, I dropped everything and immediately flipped through it. This book is so very well put together. She explains the parts of the sock, the differences in fiber types, and all the tools you’ll need to make socks. Once you get addicted like we are, you’ll start keeping a whole kit together just for your sock projects. Go ahead and set it up now, you’ll thank me later. One thing I love about this book is there are two patterns explaining the basic sock methods: Toe up and Cuff Down. And Karen has written the patterns where you can change color in each different part of the sock. It’s not necessary, but if you’re making socks for the first time, this is really great to understand the concept of what you’re doing. I love it. Another thing I love about this book is the patterns themselves. There’s a great mix between toe-up and cuff down. There are two socks sized for men (which after making socks for my dad and brother after extrapolating a pattern I typically used, this is a great thing…less math for me!). All the sock patterns suggest sock yarn, which means these will fit in your shoes! Also, no seaming (unless you’re doing cuff down, then you just have to close up your toe)! Ripple Socks. Photo copyright Leisure Arts and used with permission. These ones are my favorites and the ones I’m currently working on. I’d hoped to have at least one to show you, but life got in the way and I didn’t get them finished in time. But they will be done soon and I’ll blog about them! These are the Ripple Socks and the pattern is very easy to understand. I will share one bit of advice. Trust Karen. Seriously. She knows what she’s doing. I had a moment where I thought, “Hmmm, that’s different than I usually do it, I better be prepared to fudge it to make it work.” But you know what? I didn’t have to. It was perfect. The photography is fabulous in this book. Especially in the first two patterns which are broken down like tutorials. Perfect for new sock crocheters. The patterns are clearly written. Everything you need to know is there. 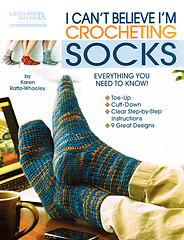 If you’ve ever thought of crocheting socks, this is the book to get. Karen, as a fellow sock addict, I’m so thankful you did this book. Why do you love crocheting socks so much? There are lots of reasons! They are fast and portable. A whole lot faster than knitting socks! I love all of the self-striping and long-striping yarns available in sock weight yarns. I end up crocheting a whole lot longer because I want to see “what the next color will do”. And then when that color is done, I want to see the next one. LOL! Many crocheters seem to be afraid of crocheting socks. Why do you think that is? Honestly, I think crocheters are intimidated by the size of the yarn. When you see a knitter knitting socks, they are using very small needles (Size 0 sometimes!) That is not true with crochet. I actually encourage using a larger hook than you would normally in order to get the drape and elasticity needed for socks. Crochet is already dense. The larger hook helps reduce that density. The other thing I think that crocheters don’t realize is that you can use sock yarns. So many patterns in the past use sport or worsted weight yarns. The result is “slipper-like” socks, that won’t fit in a shoe, and many times are so bulky that most people don’t like the way they look. By using sock yarns with a slightly larger hook, the result is a sock that can be worn and is lovely to look at. What would be your advice for a crocheter trying socks for the first time? Should they do one of the tutorial patterns in a larger yarn? I know you suggest a “light” yarn for those. Do you find this helps the crocheter learn the steps before committing to smaller sock yarn? If a crocheter hasn’t made socks before, I would say, definitely try the cuff-down tutorial pattern first. Try using the sock yarn first, but if you are struggling, then go up to sport or worsted weight. Once you can see what you are looking for, then bump back down to the sock yarn. The cuff-down sock would be the best for a first timer. Once that has been accomplished, the toe up will make more sense. There are so many sock yarns on the market now. Do you have a favorite sock yarn? Do you prefer yarns that will stripe or just regular variegated yarns? What’s your go-to sock fiber? As far as fiber, I really love yarns with bamboo in them. Not only are they soft, but they have a beautiful sheen. I always make sure that my yarns have a little wool or acrylic for those who might be allergic to wool. Wool and acrylic have more elasticity than cotton, silk or bamboo. Using a blend helps with fit! My LYS just got in a sock yarn with Cashmere. I haven’t tried that one yet, but just by touch I think that could be a new favorite. 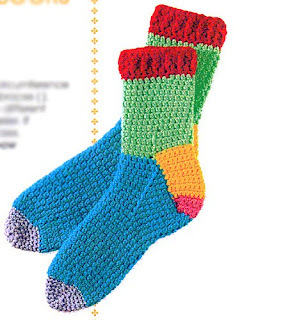 What is your number one tip for sock crocheting success? I think the best tip I have is to TRUST in the pattern. I teach that all the time in my sock classes. A lot of the time my students will start a toe-up sock and it just doesn’t look right to them at the beginning. Many times the pattern for a sock isn’t straight forward. But if you just trust and keep going, you will discover that it usually works out in the end. One of the complaints I hear about making socks (both by crocheters and knitters) is having to make two items from the same pattern. Any tips to help stave off the dreaded ‘second sock syndrome’? Split your ball of yarn, and work both socks at the same time! If you purchase a large ball of yarn (350-450 yards in a single ball will usually make a pair of crocheted socks) have the LYS wind and split the ball evenly for you. If you have to do it yourself, use a kitchen scale that has grams. Weigh the ball before and then keep weighing until you have split the ball in two. When working the pattern, do the cuff on one sock then do the cuff of the other. Then one leg, then the other. Same for the heels and foot and toe. It goes faster and you don’t have to remember for very long or have to write down your row counts as much if you do it this way. And it is something that knitters cannot do necessarily unless they know how to knit 2 at once on a circular. We just have to pull the hook out. Confession time. I have nine pairs of completed crocheted socks and three pairs that just need some finishing (or are close to being done). Just how many pairs of crocheted socks do you have? For myself, I only have 2-3 pairs. My kids each have more than that and even my husband has a pair. The rest of the socks have gone to either family, models for classes and/or books! Although I do have a pair that are in progress just for me! If I ever get a chance to get back to them! I’m beginning to think I might have a problem now. I’m a huge fan of toe-up socks because I hate that seam at my toe (and no matter how smoothly I try to do my whip stitching, I can always feel it). What’s your favorite direction to work your socks? Toe up is definitely my favorite way as well. I am one of those people who doesn’t like to sew either. This way, I only have the ends to weave in. However, there are times that the cuff down with the heel flap and gusset are better. I think for men’s socks especially. Men seem to have trouble with getting their feet into socks if it is too tight at the ankle. The way I do my short row heels help in the ankle area. And I am working now on a pattern with a toe up heel flap and gusset pattern, so that I can avoid that issue. For people who may want a hands on lesson in learning to crochet socks, where can they take classes from you? I regularly teach at Crochetville.org. I have 2 sock classes on the schedule there this year. Cuff down starts May 6th and Toe Up starts November 4th! I am also starting to teach online at my website. The Crochet Learning Studio will be open this month, hopefully by March 7th, 2011 for registration. The link is http://www.krwknitwear.com/learningcenter. I have a newsletter there just for classes, so be sure to sign up if you are interested. If you are local to me, I teach classes at Great Yarns! in Everett,WA http://www.greatyarns.com. Check the website for the class schedules. I also teach nationwide. If you have a guild or a shop that might like to have me come and teach, let me know! I love to visit new places! I also teach at major events like Stitches and The Knit and Crochet Show. I always have my schedule on my website: http://www.krwknitwear.com.